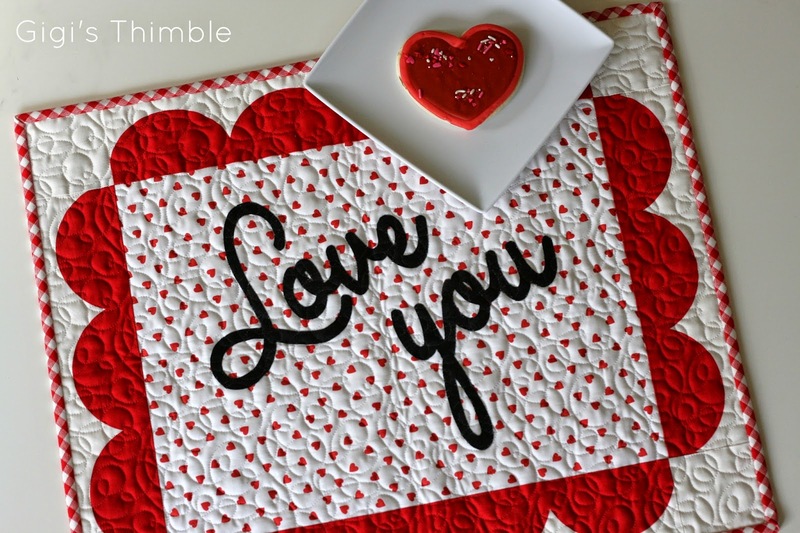 Thanks to all of you who stopped by my blog last week to check out my "Love You" placemat and tutorial! I had so much fun creating the pattern using Lakehouses new Scalloped Print Panel and my family sure has enjoyed having it around the house the last couple of weeks! Oh, and here's a little secret, I plan to use it all year around! I think the "Love You" placemat is the perfect little detail for leaving sweet treats (or an after-school snack) on the counter for your little ones or serving a special breakfast in bed. It reminds me of those red "You Are Special" plates my mother had when I was a child. You know the one's I'm talking about, right? Well, as promised I'm giving away some of the Scalloped Print Panel so one of you can make your very own placemat! But before I announce the winner, first, a thank you for sharing all of your sweet Valentine's Day traditions with me! This has got to be one of my very favorite holidays! Spending time with the ones you love and thinking of clever ways to show each other you care - It's the best! I always give my husband and two kiddos small little presents with a note to say I love them! Congratulations Jacqueline! Please send me an email with your mailing address and I'll get this sent off to you! I hope you all have a wonderful Valentine's Day weekend! The "Love You" placemat tutorial can be found HERE.